Having been in the workplace for a long time and having always been in the travel and tourism industry, I consider it necessary – no, a duty – to take vacations. To travel to new and exciting places and have a good time. For me, the new experiences added to my professional knowledge. They gave me more ammunition to use in persuading my customers to spend money on travel, or allowed me to help my business travelers. Now back in pre history, without the ever-on email, global communications and such, taking break always meant coming back to uncompleted work, piles of letter, lists of folks to be called back. That was the downside. The upside was the comments about the suntan, and the ‘Don’t you look rested’ remarks. Again, being in the industry helped and most folks I worked with and for looked on travel as an educational experience. Indeed, one company insisted that in addition to vacation time, all our employees, from the front line staff to back office specialists like accountants and maintenance people took a long haul trip once a year – we were a long haul tour operator. We provide the ticket and the time. The idea proved its worth over and over. The people we worked with were motivated, knowledgeable, rested, and loyal. A recent report by ‘Project:Time Off’ is called The Work Martyr’s Cautionary Tale – How the Millennial Experience will Define America’s Vacation Culture. It’s available to download for free. It’s a fascinating and, to be frank, depressing work. It’s worrying from the point of view of a fellow human being, but frightening for our tourism industry. Although the report studies American attitudes, I have a feeling it applies to many nations. The workers who fit that definition tend to be slightly more female (52%), slightly less likely to be married (55% are married, compared to 62% overall), but what is most alarming is that they are overwhelmingly Millennials. More than 43% of work martyrs are Millennial, compared to just 29% of overall respondents. I find all this strange given that this demographic have all the tools to take vacations, yet remain ‘in touch’ if they want to. Ubiquitous internet connectivity provides the means to avoid the backlog when you get back, or the ‘not being available’ worry – if you feel unable to cut the ties for a few days. I’ll leave you to read the report, which if you’re in any sort of supervisory position you should. The future health of your employees and your organization depends on you being the change agent to modify this crazy mentality! 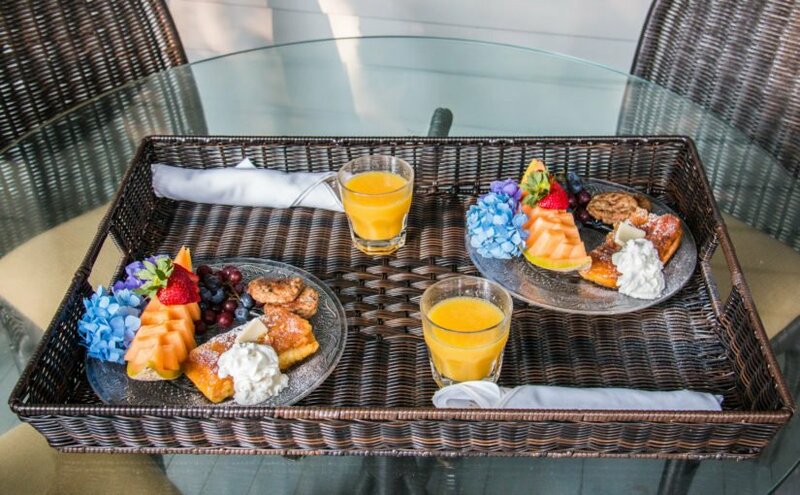 Breakfast at the Ashford Manor in Watkinsville GA. Definitely worth leaving for! cereal out of the box, and add milk, you have to clean up the bowl and spoon afterwards! No comment on the apparent laziness of this, it’s more to do with needing to be working rather than cleaning. This also gives a reason for the massive increase in the sales of coffee pods which grew by 138,325% (yes, you read that correctly) between 2004 and 2014. I actually do approve of coffee pods, as the alternative to me was a fancy coffee machine which I felt I had to use. That resulted in way too many espressos a day….but I digress. So the need to concentrate on work appears to be the reason for not taking vacations and not eating cereal. Interesting sociological points. Hopefully as they age, the Millennials will chill out and start to consider their position. They’ll realize that there’s more to life than always working, and that dedication to work and vacationing are not mutually exclusive. In the meantime we have the Boomers and Generation X to rely on. Although not for long. If this mindset continues, it could spread both up and down the generations. How does the Industry react and how do we – who depend on people visiting our hotels, resorts, attractions, locales and areas; on using our airlines, car rentals, trains, buses etc – make the vacation experience compulsive? It appears that Millennials only listen to their boss, with 30% saying the boss is their most powerful influencer. Boomers on the other hand list their families (25%) and their doctor (21%) as the most powerful. Only 13% of Millennials consider their doctor – which is not surprising given their age. Perhaps the Tourism Industry need to deal with the boss. Making deals with companies to persuade their employees to travel for leisure? Allowing employees to tack leisure trips on the end of business trips? Using leisure travel as a reward for good work? I don’t have all the answers (call me for some of them! ), but it is a question that our industry needs to address – maybe while you’re relaxing on vacation…. Back in 500 BC, tourism wasn’t much as we know it today. However, in Ephesus in what is now Turkey, a gentleman called Heraclitus was pondering, as ancients tended to do. “Change’ he said (in Greek) ‘is the only constant in life’. We can’t look into the future with any certainty, and no matter how informed or clever we are, there’s always something ready to throw a wrench (or spanner, for my English friends) into the works. This certainly applies to tourism, of course. We know that nothing will remain the same. The visitors of today will age, and with age comes changes in needs and changes in desires. Possibly also changes in circumstances. Different demographics emerge – see the rise of the Boomers and how as their children grew and left home, their vacation choices changed. The emergence of the Zoomers – Boomers with Zip – who seem to be mirroring (but with more money) the ways of the Millennials. This Millennial group are always touted as having completely different needs to prior generations, but research seems to be proving that generalization wrong, or at least to be too simplistic. Then there’s the change from where visitors come. On a local level, that shows up when a neighboring state or country experiences a change in fortune (for better or worse) that increases or decreases visitation. On a world wide level the emergence of new economies has major impacts. 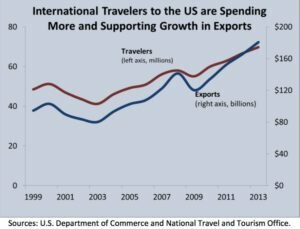 Look at the enormous increase in world travel from China and India. Of course the ‘wrench in the works’ law comes into play, and the burgeoning Brazilian market (for the USA in general and Florida in particular) has taken a major hit with Brazil’s economic woes. Same applies to Russia. However in the long game, these are probably blips. The thing is, tourism is increasing and has been for many decades. It’s an almost unstoppable effect as humans are forever inquisitive and of an exploring nature (even if it’s ‘soft’ exploring!). 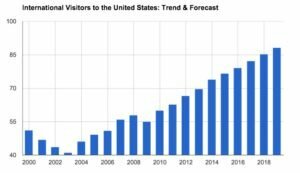 The chart above (From the US Department of Commerce and National Travel and Tourism Office) shows the continuing rise in tourists to the USA since just 1999. Yes, the ‘wrench’ effect applied following 9/11 in 2001 and again with the global recession of 2008/9, but the overall effect is ever increasing numbers. The Skift report chart above shows the trend and forecast for international visitors to the USA. Since the post 9/11 dip and the wobble 2007/9 the results and forecast are ever upwards. http://ow.ly/N9lX3039BTN) show that recent years have seen travel and tourism growing at a faster rate than both the wider economy and other significant factors like automotive and healthcare sectors. Visitors from emerging economies are now a 46% share of international visitors, up from 38% in 2000. The problems in Russia and Brazil will have a slowing effect but falling oil prices (which affect living costs, increases disposable income and lowers air fares) will provide a contrary influence. So, expansion of tourism is predicted to continue at a stronger pace than last year. Back to Heraclitus. Change is the only constant. We know that the future will not be the same as the past. If we rely on doing the same things as we always have – if we don’t at least look at the possibilities for change, we’re going to fail. We have to reinvent, and we have prepare for change. 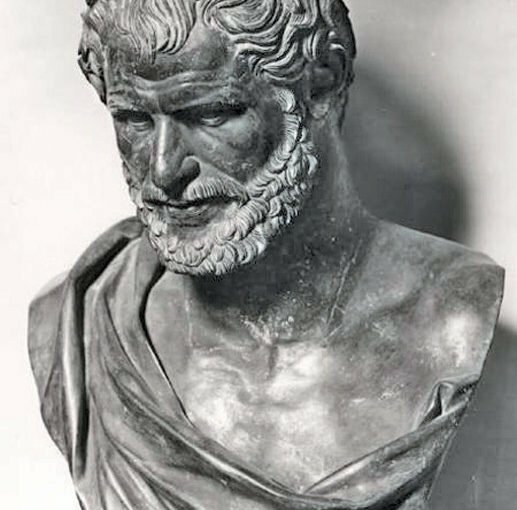 Getting back to Heraclitus again, we must be preparing for the change to our business that will inevitably arrive. We must look at where our visitors not only traditionally originate and where they are starting to come from, but where they will come from in the future. We must be ready to adapt to the way people will think not only in the near future, but in 5 and 10 years. We may not be completely accurate in our predictions, but we can make pretty reliable guesses. The one thing we will know for certain – things WILL change.